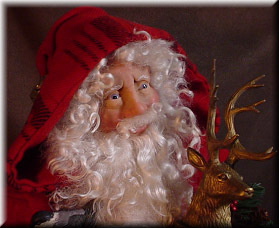 Santa's outfit was created from a red Hudson Bay blanket. 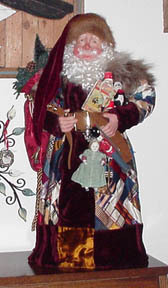 Santa's robe and PJs are made from French drapery fabrics and his throw from a vintage paisley shawl. 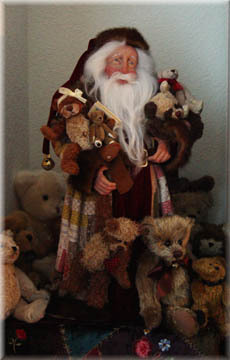 His toys are reproduced from vintage toys and books. 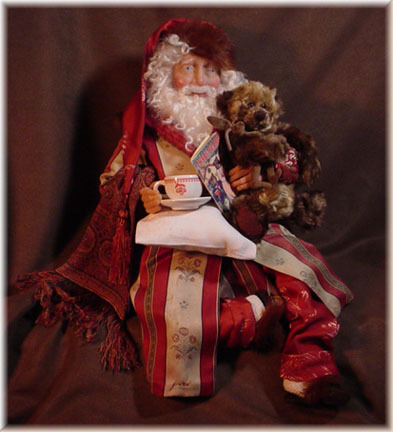 The bear is signed by the artisan who created it. 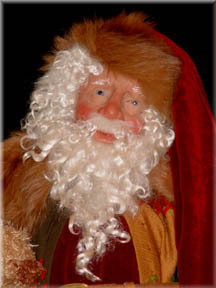 Santa's velvet jacket and cap ar trimmed with fintage fur. His embroidered wool vest adds a touch of elegance and his gifts a glimpse of that elegant age. 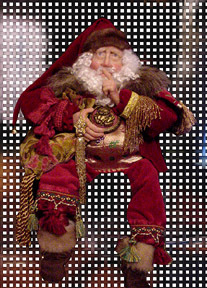 Santa's trousers are from an early 1900s patchwork quilt. 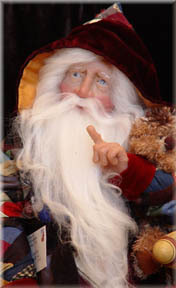 His cap and coat are made from aged velvet, and the cap is trimmed with vintage fur. 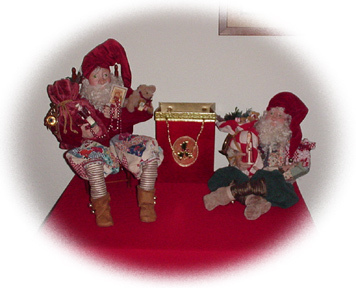 Each tiny teddy bear is hand-crafted and signed by the artisan who created it. 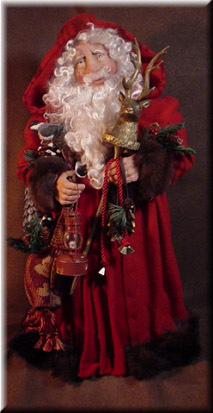 Santa's silk herring-bone robe and hood are trimmed with aged velvet and adorned with a hand-forged bell. 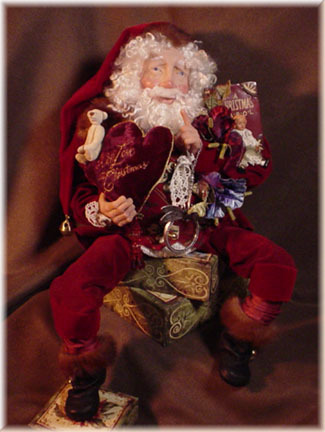 His gifts are reproduced from vintage toys and books. 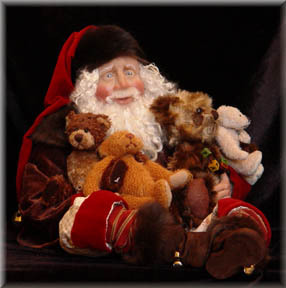 The teddy bear is hand-crafted and signed by the artisan who created it. 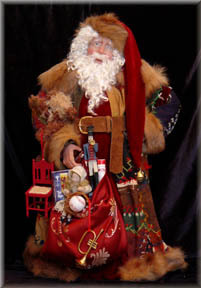 Santa's jacket is from a vintage crazy quilt and is trimmed with antique fur. His bag full of treats is of French drapery fabric. 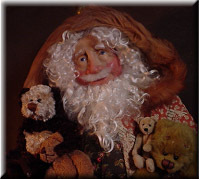 The teddy bear is hand-crafted and signed by the artisan who created it. 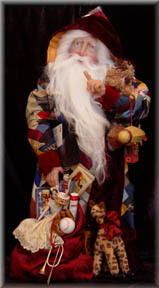 Santa's robe is made from an antique patchwork quilt that dates from the 1920s. 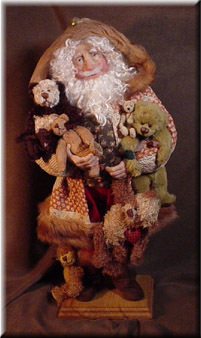 He is trimmed with vintage fur. 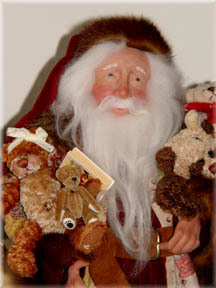 Each teddy bear is hand-crafted and signed by the artisan who created it. A few teddy bears were added by Holly!